When I was a child we used to refer to a bird splattering the car window screen with its guano as leaving ‘luck’. As an adult responsible for washing my own car I fail to see what luck has to do with it. However, back to matters in hand, the lucks of today’s post as rather prettier and infinitely more historic – although once again in some instances ‘luck’ seems to be missing from the equation. The first luck is the ‘Luck of Edenhall’ which used to be in possession of the Musgrave family of Edenhall. 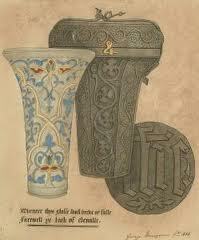 The ‘luck’ is a beautiful gilded and enamelled glass beaker (it looks like a vase to me but what do I know). It was made in Syria so the chances are that it made its way home in the trunk of a Musgrave crusader. Remarkably it survived the joys of reiver warfare, heavy handed drinkers and the washing up bowl. Though to be fair it must always have been prized because when not in use it was kept in a leather container that had been made in the Fourteenth Century. The case bears the letters IHS suggesting that it was once used as a communion challice. The luck was still in one piece at the beginning of the Eighteenth Century when the current owner decided it would be a good idea to drink the health of the entire family from the priceless heirloom. Luck must indeed have been on the side of the Musgraves because it survived and went on to feature in a ballad. Border ballads had been popularised by Sir Walter Scott and James Hogg at this time and “The Drinking Match” was a modern contrivance which featured the medieval glassware. From there it was one small step to the fairies – quite literally at the bottom of the garden – who were supposed to have given the luck to the Musgraves after water was drawn for them at a well. The Musgraves aren’t the only family to have a ‘concrete’ luck that they need to guard against disaster. The Lamb Family of Great Salkeld had a brass dish allegedly given by hobgoblins at a wedding feast. A girl from the wedding family went to a nearby well to fetch water where she was accosted by a hungry hobgoblin – or gaggle of hungry hobgoblins depending on the account- who said that they would bless the bride and groom in exchange for food and drink. 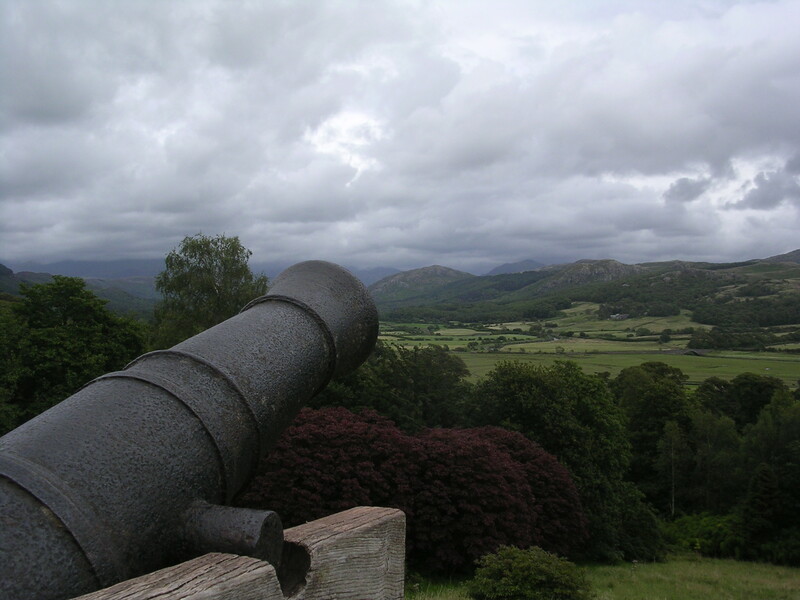 Sir John Pennington was the Lord of Muncaster Castle during a portion of the Wars of the Roses. In the aftermath of the Battle of Hexham (15 May 1464) King Henry VI was found wandering over the fell. He was taken to Muncaster where Sir John and his wife cared for the broken monarch for the next nine days. When he left the monarch – who could have done with a bit more luck himself- gave the family a glass cup telling them that they would prosper so long as it remained unbroken. It is still on display in Muncaster Castle. The final luck in this post brings us to the Luck of Workington. Mary Queen of Scots fled across the Solway Firth in a fishing boat with sixteen companions. When she arrived she had very few possessions and needed shelter. Lord Herries, a Scottish Lowland laird who’d remained loyal to his queen sent a message to Sir Henry Curwen of Workington with whom he had a friendship. Sir Henry sheltered Mary until she could be escorted to Carlisle Castle. When she left she gave the family a small agate cup as a token of her gratitude. It became known as the Workington Luck. This entry was posted in Fifteenth Century, Fourteenth Century, Kings of England, Mary Queen of Scots, Sixteenth Century, Wars of the Roses and tagged Battle of Hexham, border ballads, Edenhall, Great Salkeld Luck, King Henry VI, Luck, Luck of Edenhall, Muncaster Castle, Muncaster Luck, Musgraves, Sir Henry Curwen, Sir John Pennington, Workington Luck by JuliaH. Bookmark the permalink.